Identification Card. 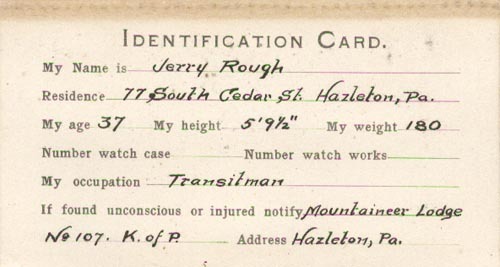 My Name is Jerry Rough. Residence: 77 South Cedar St., Hazleton, Pa. My age: 37. My occupation: Transitman. Are you looking for ROUGH ancestors? If so, we suggest posting a query to our Community Message Board to get assistance from other researchers.